The Australian Jockeys Association and National Jockeys Trust are deeply saddened by the events on Saturday 8 April involving the death of one jockey, and critical injuries to another three riders. The tragic passing of Darren Jones as a result of a race fall at Warialda in NSW has been a tremendous loss to wife Sheridan, sons Jacob and William and to the NSW racing community. The three-horse fall at Warialda resulted in 22-year-old Tamworth based apprentice Melanie Bolwell suffering head injuries and being airlifted from Warialda Hospital to the Gold Coast Hospital where she is heavily sedated in ICU with her family holding a bedside vigil. The same day, former jockeys Ben Saunders and Wade Clasohm were injured in a trackwork incident at Toowoomba and are currently in Brisbane hospital with severe spinal injuries. Darren Jones was a highly regarded and respected member of the racing community, serving on the NSW Jockeys Association committee for 20 years. “It just highlights the dangers of the job. We have 200 jockeys in NSW and one a week go to hospital by ambulance. Australian Jockeys Association Chairman Des O’Keeffe highlighted the imperative nature of support for the injured riders, their families and the riding community during such tragic events. “It is important to note that the Australian Jockeys Association and National Jockeys Trust were there to provide immediate support to the injured jockeys, their families and the riders, following the introduction of our Critical Incident Response protocols” said O’Keeffe. 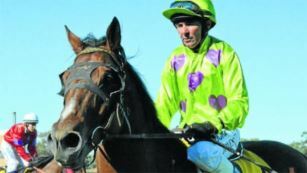 “The AJA advised all jockeys at Randwick and Warialda in person of Darren Jones passing, and were provided with details of counselling assistance which was made available immediately. All other riders nationally received this information via text message. The principal purpose of the National Jockeys Trust is to provide support for former and current jockeys, and their families who are in necessitous circumstances as a result of serious injury, illness or death of a jockey. Insurance benefits have improved significantly since 2009 but there are still any number of riders from years gone by, and even from the present group, who seem to slip through the cracks when it comes to workcover and other insurance schemes. NJT has provided over $3 million in assistance to in more than 300 jockeys and the families of jockeys who have suffered serious injury, illness or death. According to the Menzies Institute, the occupation of a Jockey is the most dangerous in Australia. It is a requirement for an ambulance to follow the field in every race. A jockey weighing 50-60kg riding a 550kg thoroughbred at 60km per hour does not allow much margin for error. Whenever a jockey is killed or permanently disabled a family is left in hardship. · Combined with track work, there are approximately 500 falls annually. · Each year 40% of jockeys will have a fall that will prevent them from riding for an average of 5 weeks. · Approximately 5% of these falls would be termed career-ending injuries. · It is estimated that in the next 10 years we will see 10-12 jockey deaths and 50 jockeys will suffer career ending injuries including paraplegia, quadriplegia and severe brain injury. The NJT’s work is only made possible because of our principal partners, LUCRF Super, Tabcorp and private donations and fundraising activities.